The fourth Nautilus the first nuclear powered submarine was laid down 14 June 1952 President Harry S. Truman officiating at the Electric Boat Co. Division of General Dynamics Corp. Groton Connecticut; launched 21 January 1954; sponsored by Mrs. Dwight D. Eisenhower wife of President Eisenhower and commissioned 30 September 1954 Comdr. E. P. Wilkinson in command. Following commissioning Nautilus remained at dockside for further construction and testing until 17 January 1955. Then at 1100 her lines were cast off and she was "underway on nuclear power." Trials followed and on 10 May Nautilus headed south for shakedown. She remained submerged while enroute to Puerto Rico covering 1 381 miles in 89.8 hours the longest submerged cruise to that date by a submarine and at the highest sustained submerged speed ever recorded for a period of over one hour's duration. Throughout 1955 and into 1957 she investigated the effects of the radically increased submerged speed and endurance such changes in submerged mobility having virtually wiped out progress in anti-submarine warfare techniques. The airplane and radar which helped defeat submarines in the Atlantie during World War II proved ineffective against a vessel which did not need to surface could clear an area in record time and swiftly change depth simultaneously. On 4 February 1957 Nautilus logged her 60 000th nautical mile to bring to reality the achievements of her fictitious namesake in Jules Verne's 20 000 Leagues Under the Sea. 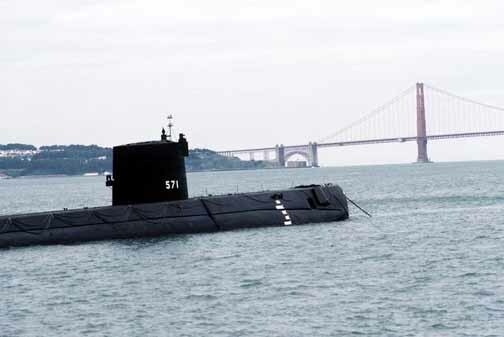 In May she departed for the Pacific Coast to participate in coastal exercises and the fleet exercise operation "Home run " which acquainted units of the Pacific Fleet with the capabilities of nuclear submarines. Nautilus returned to New London 21 July and departed again 19 August for her first voyage of 1 383 miles under polar pack ice. Thence she headed for the Eastern Atlantic to participate in NATO exercises and conduct a tour of various British and French ports where she was inspected by defense personnel of those countries. She arrived back at New London 28 October underwent upkeep and then conducted coastal operations until the spring. On 25 April 1958 she was underway again for the West Coast. Stopping at San Diego San Francisco and Seattle she began her history making Polar transit operation "Sunshine " as she departed the latter port 9 June. On 19 June she entered the Chukchi Sea but was turned back by deep draft ice in those shallow waters. On the 28th she arrived at Pearl Harbor to await better ice conditions. By 23 July her wait was over and she set a course northward. She submerged in the Barrow Sea Valley 1 August and on 3 August at 2315 (EDST) she became the first ship to reach the geographic North Pole. From the North Pole she continued on and after 96 hours and 1830 miles under the ice she surfaced northeast of Greenland having completed the first successful voyage across the North Pole. Proceeding from Greenland to Portland England she received the Presidential Unit Citation the first ever issued in peace time from American Ambassador J. H. Whitney and then set a westerly course which put her into the Thames River estuary at New London 29 October. For the remainder of the year she operated from her homeport New London Connecticut. Following fleet exercises in early 1959 Nautilus entered the Portsmouth Naval Shipyard for her first complete overhaul (28 May 1959-15 August 1960). Overhaul was followed by reresher training and on 24 October she departed New London for her first deployment with the 6th Fleet in the Mediterranean returning to her homeport 16 December. Nautilus operated in the Atlantic conducting evaluation tests for ASW improvements participating in NATO exercises and during the fall of 1962 in the naval quarantine of Cuba until she headed east again for a two month Mediterranean tour in August 1963. On her return she joined in fleet exercises until entering the Portsmouth Naval Shipyard for her second overhaul 17 January 1964. On 2 May 1966 Nautilus returned to her homeport to resume operations with the Atlantic Fleet. For the next year and a quarter she conducted special operations for ComSubLant and then in August 1967 returned to Portsmouth for another year's stay following which she conducted exercises off the southeastern seaboard. She returned to New London in December 1968 and into 1970 she continues in operations as a unit of the 2nd Fleet.